“Since November 11th is upon us (The 11th hour of the 11th day of the 11th Month), I thought it would be a great time to explore souvenir buildings of the Great War (WWI). Shortly after World War I, many of the countries that fought in the war started to commission and build monuments to the men and women who fought on Flanders Field. Many of these monuments were build in the 1920 and 30’s. Soon after the monuments were erected, souvenirs were made for either the dedication ceremony or for the returning veterans and their families touring the battlefields. 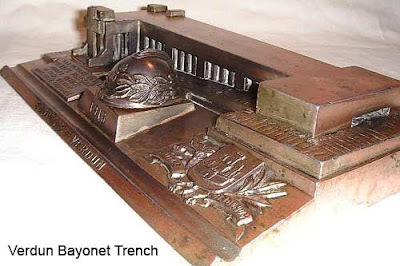 Many WWI souvenir monuments have been made in France. Inkwells seem to be a popular function. One such souvenir is of the Bayonet Trench that is located at Verdun. This version is a very rare piece most likely made between when it was dedicated in 1920 to 1930’s. 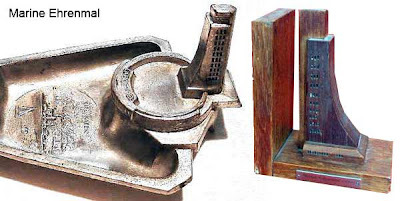 A French WWI army helmet hides the inkwell. Another souvenir from Verdun is the Douaumont Ossuaries. The real monument contains the remains of 130,000 unknown French and German soldiers who fell on the battlefields of Verdun. This paperweight is most likely made in the 50’s or 60’s for tourists visiting the monument. 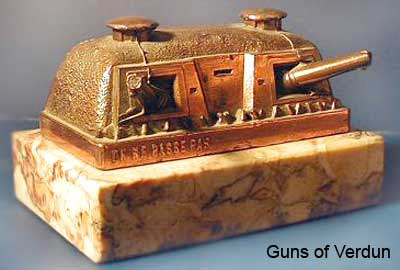 One battle beside Verdun commemorated in souvenir buildings is the battle of Ypres 1914-1918. One such souvenir is of the Ypres Canadian, a brooding soldier monument. This souvenir is made of brass and could have been manufactured in England. 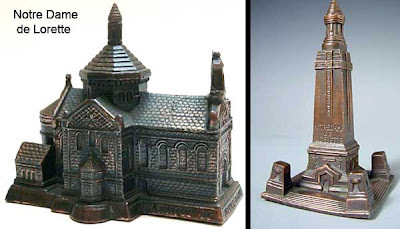 There have been several versions of this same brass souvenir with different bases. There appears to have been a crude recast made in more recent times (center photo). Brass U.K. made souvenirs from Ypres perhaps due to the large number of British Empire troops which were engaged in the battle. 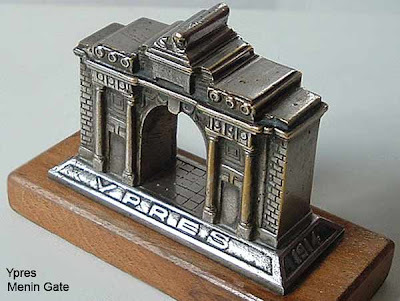 Another example of English brass work is of the Menin Gate. The memorial opened on 24 July 1927 as a monument dedicated to the missing British and Commonwealth soldiers who were killed in the fierce battles around the Ypres Salient area who have no known grave. Not to be left out, the Hill 60 monument is also from this same battlefield. It is made of brass and commemorates the fierce battle that took place between German and English troops who captured and retook the area repeatedly. Later, during WWII, Hill 60 was also the sight of a desperate battle between the Germans and A Company of the 2nd Battalion Royal Scots Fusiliers in May 1940. The memorial's plaque to the Australian miners bears the scars of this battle. 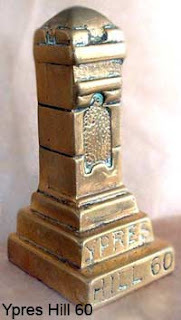 One of the strangest souvenirs from the battlefields of WWI France are the Voie Sacrée ("Sacred Way"). This is the name given to the road between Bar-le-Duc and Verdun, because of the vital role that it played in the Battle of Verdun during World War I. 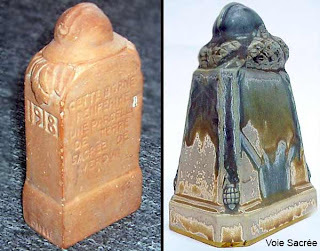 These terracotta and ceramic souvenir monuments claim to contain the sacred soil from the Verdun and Somme battle fields (Depending on what battle is inscribe on the outside) and are plugged on the bottom with wax. Pick one up and you’ll hear the sacred soil moving inside. Notre Dame de Lorette commemorates bloody fighting from January - March 1915, in which the 31st Battalion of French infantry eventually held the line and saved their country. Souvenirs of Notre Dame de Lorette of both the Church (rebuilt after the war) and the Lantern Tower appear to be from the 1920-30’s - just like most of the souvenirs of WWI monuments. Both are French made and it also seems that most WWI souvenirs appear to be made in the country whose troops it commemorates. 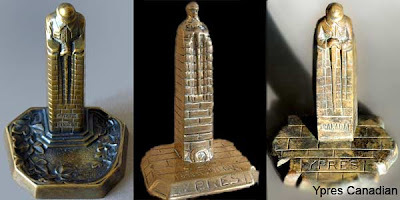 Two other WWI-associated souvenir monuments are the Marine-Ehrenmal in Laboe, Germany and The Ijzer Tower in Diksmuide, Belgium. Both memorials were completed after WWI. The Marine Ehrenmal monument was completed in 1936 and was a memorial to the First World War fallen German marines. Since WWII, it is now a memorial to fallen seamen of all nations. The souvenirs of this memorial are in different sizes. Some are ashtrays, bookends and paperweight. Most appear to have been made in the 50’s – 70's in Germany. The Ijzer Tower was constructed from 1951-1965. Inside, there is a museum which covers the history of WWI and Flemish nationalism. Souvenirs of the tower are from the 50’s and 60’s and are in various sizes. At 5:10 am, 11 November 1918, representatives of the German high command signed the armistice dictated to them by Marshal Foch, Supreme Commander of the Allied Forces. Six hours later at the 11th hour of the 11th day of the 11th month of 1918, World War I ended. The Armistice Monument in Compiegne, France is dedicated to Alsace Lorraine and consists of a bronze sculpture of a sword striking down the Imperial Eagle of Germany framed by sandstone from Alsace. An Armistice monument souvenir recently sold on eBay for $220.